The graphics and the music are the indisputable merit of the game. In such cases the issue is always in tasks and design. King Arthur provides you with two game modes. You can either choose the casual mode (an exciting adventure without scoring) or fearless mode (you’ll get score and even rewards). After you’ve decided on the mode you’ll begin with the tutorial. But get prepared for the Merlin’s lecture at first. Merlin will tell you the already known things about Arthur, but the voice is really cool so at the beginning personally I even enjoyed the prologue. By the way for those of you who prefer reading to listening, the text of Merlin’s story is provided with an arrow in the corner. So when a feeling of “too much Merlin” appears you may skip his talks. Actually there is a Merlin’s journal in the left corner of your screen when you play, so if you’re interested in the story, you may just read it and skip interludes with Merlin. 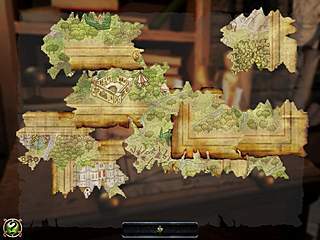 After you finish tutorial the first puzzle you have to tackle is a torn map. The map you’ll need throughout all the game, as there will be pointed all the locations you need to visit. What I liked the most about it was that I didn’t need to wander back and forth between the locations trying to guess what I need to do and where. I get really annoyed with the random roaming that makes me forget where I am and what for. Here in King Arthur all the locations you have to visit at every level are marked. The puzzles are diverse: starting with the math tasks ending with catch the squirrel (you need to be just fast enough to click the hollow right the moment the squirrel looks out of it). But they didn’t turn out to be hard. Perhaps that is why there are no instructions for them. But the hidden object scenes are really catching. The list of items consists only of 6 elements, while the general amount of them is pointed at your right. Some stuff may be broken into pieces, so you need not only to find the pieces but also combine them. 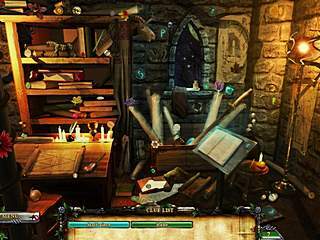 In some hidden object scenes you’re given not the names of the items, but their images. For example you need to find several various swards – all of them are pictured in the list, as despite the difference in form sword is still a sword. The hint system is not typical. You don’t have it in the beginning no matter whether you play the casual or fearless mode. The only prompts are with the sparkling circles around the items that appear from time to time. There are four types of hints. The one just removes the object; the others show it in different manners. 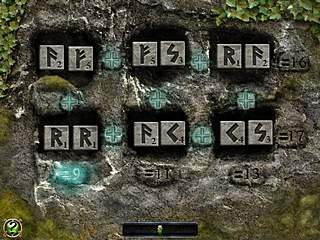 But in order to activate the hints you need to collect runes. The runes are always highlighted. The multifarious combinations of runes activate varied types of hints. In connection with all these it is time to specify the difference between the game modes. In the fearless mode every object found nets you 100 points, but every rune taken gets you 200 points. Misclicking is always a bad habit: in the fearless mode it takes off 10 points while in the casual mode after several random clicks it becomes darker. The more you click, the darker it gets up to the moment of a small enlightened area around your cursor. But relax, it is just for several seconds. As for the graphics, you’ll definitely enjoy it. The colours are vivid, the elements are accurate. But the music is even better. So the graphics and the music are the indisputable merit of the game. Those of you who are not yet tired of the King Arthur’s legend and appreciate well-done artwork will enjoy the game. And what’s over this is a kind of a godsend for those of you who are tired of interactions and vain attempts to use the inventory. This is King Arthur review. Download this game here.